If you share the philosophy that time is a very important commodity while building applications, and that as much as possible, development time should actually go only to building the critical part of an application; the business logic, database design etc and not on mundane task or task that can easily be duplicated then you belong to my school of thought. CSS Tab designer is a tool that enables you to maximize precious time in designing the user interface of a website/web application. It is a software that helps in creating CSS based navigation list and tabs visually without having to spend time writing codes. It so easy and so cool. On the fly, you are done creating the look and feel of your navigation, leaving you with time for other things. I'm sure this is a tool that you will derive a lot of utility from. It's free so you can go and download it straight away. If all you want to do is convert a file from one format to another, and you don't see the sense in installing a software for just that singular purpose, then zamzar is an application you will like. zamzar is an Ajax application that enables you to upload a file and then convert it to the format of your choice. The conversion is done on their server, meaning you don't have to install anything on your computer. 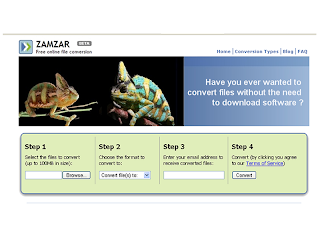 At the moment, zamzar is in beta version and currently it supports over 150 different files conversion. And if you have being looking for a way to make those PDF's editable, why not just use zamzar and convert them to MS WORD where you can edit them? Yeah, it can do that to.